Last week we looked at the list of 100 Books to Read in a Lifetime. presented by Amazon.com. I suggested that there were some obvious omissions that made sense, and raised my eyebrows at some of the most prestigious literary names that were shut out. Anomalies in Amazon’s list that might have a lot of puzzled people scratching their heads (in last week’s post). The top 10 books that Amazon should be spanked for leaving off its list – these are just too obvious. Another 90 books that Amazon should also have considered for its list, but we won’t spank them for leaving them off. Hamlet. 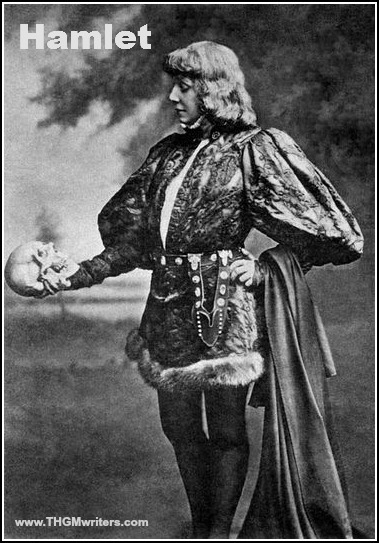 Is there an image more representative of literature and acting both at once than Hamlet talking to the skull. Or a quote from literature better known than “To be or not to be, that is the question”? And who could forget Poloneus’ life instructions to his son? Hamlet has been made into 29 films over the years, and the story overlapped many others. The Wizard of Oz. The first book in a series of 15, as well as numerous spin-offs by author Lyman Frank Baum and many fan fiction volumes, has created numerous cultural icons. The notion that witches are green and fly on broomsticks was popularized by The Wizard of Oz, and bestselling the Wicked series (and the associated Broadway hit musical) is an interpretation of the story. The original book is often cited as a commentary on economic policy under the guise of a child’s book. Romeo and Juliet. What story is the archetype of true love? What image is called forth to represent lovers more than any other in literature. Blue Oyster Cult, Dire Straights, The Pointer Sisters, Lou Reed, Pink, Bruce Springsteen and many other sang about them. Google returns 14,000,000 results for “Romeo and Juliet”. Check out the ridiculously long list of screen adaptations of the story. Shakespeare’s iconic couple might just be the best known symbol of lovers. A Tale of Two Cities. According to Wikipedia, this is the bestselling single-volume book of all time. Charles Dickens depicts the story of the French Revolution, including the cruelty and brutality preceding the events. The two cities are London and Paris. It is strange that this book has been left off Amazon’s list, when Great Expectations was included. A Christmas Carol. Bigger than A Tale of Two Cities, or Great Expectations in the public consciousness is the ultimate classic Christmas tale that brought us the iconic Ebenezer Scrooge – or just “scrooge” when applied to anybody acting stingy at any time of the year. Almost as iconic is Tiny Tim, a symbol of hope in the most grim circumstances. If ever there was a book that has come to represent generosity and charity in the human spirit, this is the one. Chicken Soup for the Soul. This is a ground-breaking book that virtually created the feel-good sub-genre of self-help books. There are now over 400 Chicken Soup for the Soul books in print, translated into almost every language. The 7 Habits of highly Successful People. Stephen R. Covey created what might just be the most successful success-oriented self-help book of all time, although I concede to being uncertain whether this book or Napoleon Hill’s Think and Grow Rich or Dale Carnegie’s How to Win Friends and Influence People should be in this spot. Both are frequently referenced. The Little Engine that Could. Since children’s books are included in Amazon’s list, lets add one of the top classic of all time – a book that almost every adult would be well-advised to read each morning before starting the work day. Watty Piper’s motivational storybook is a timeless classic with an important message. The Da Vinci Code. If any book from this century deserves a berth on the top 100 books to read, it is Dan Brown’s mystery thriller that has sparked debate over so many questions related to the Holy Grail, Mary Magdalene, the bloodline of Jesus Christ, Da Vinci’s “Last Supper” painting and the Catholic Church itself. The book dominated the New York Times best seller list for over two years, selling over 80 million copies. I know this is a controversial choice, and that I’ll be skewered for its inclusion on this list. Tough! Grimm’s Fairy Tales, Vol I. Of all the fairy tales passed down through the ages, none is as iconic as Cinderella, the classic tale of unjust suffering and triumph over oppression. When people talk about a “fairy tale wedding” and their dream wedding dress, their image is based on visions of Cinderella. Although first published as part of a French book of tales by Charles Perrault, it was popularized by the Brothers Grimm in Grimms’ Fairy Tales. This volume also happens to contain Rapunzel, Hansel and Gretel, Snow White, the Golden Goose and several other well known tales. In alphabetical order, here is the rest of my list of 100 books that Amazon left off its list. Please note that I do not propose replacing all the books on Amazon’s list with all of these, although I would replace some. This is simply meant to provide alternatives and to bring forward some books that might very well have been included (and most were probably debated by the Amazon book editors). * Personal note: The inclusion of a title on this list does not mean I have personally read it. 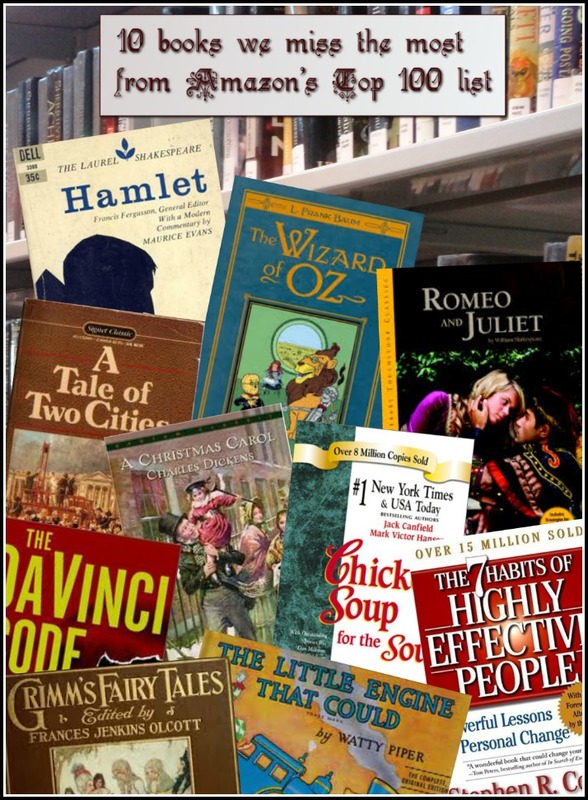 In fact, even among the Top Ten above, I have not read Romeo and Juliet, nor the entire Grimm’s Fairy Tales, and I have only seen Hamlet and A Christmas Carol performed on stage and screen respectively. Classics, what can I say Dave. I haven’t read all, but probably 80% of the list was read in my school years. Actually I have study and analyse some of these books at school. I can guarantee that any list that includes Dickens (who proved in every tome that he was paid by the word) or the Bronte Sisters is a problem. Their stories can best be retold in 1/3 the words or less- without missing a beat. Glad to see a couple of my faves on your list, but I can see I have a lot of reading to do! I love that you include Future Shock on this list. A while back, I included it on a curriculum I put together to teach Sci-fi and Religious literature comparisons. While some of it is a bit outdated and wrong, it’s amazing to see how people then thought we would live now. It’s equally fascinating to apply those same principles to our own future.